Things are winding down here. Grades are done, tests are bundled for the Exam-collection-in-the-sky, and I’m cleaning out my desk before we face our last flurry of correcting the Lise Prep Exemption Exams. Meredith directed a VERY professional moderation session for us yesterday morning, but we have four more days of thumb-twiddling before the students take the exam. David’s reading, I’m writing, and Celine is writing e-mails. (We have the smallest office). Neil just popped his head in after delivering all his exams to what we call “The Dark Side” (admin is on that side of the building). It’s down three stories, across the building (about 150 yards) and up a story. We have no carts, so we roll desk chairs piled with packaged exams (luckily, we have an elevator). 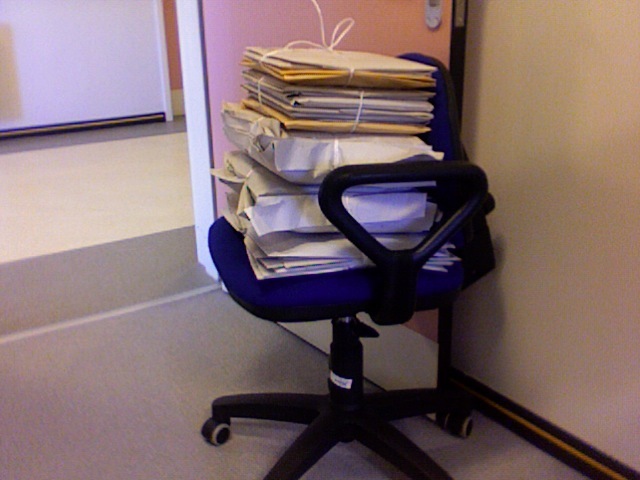 Neil announced that after humiliating himself rolling an exam-laden chair through the corridors to the other side, he realized that they’re then piled on a cart and rolled back over to be stored on this side of the building. Go figure. 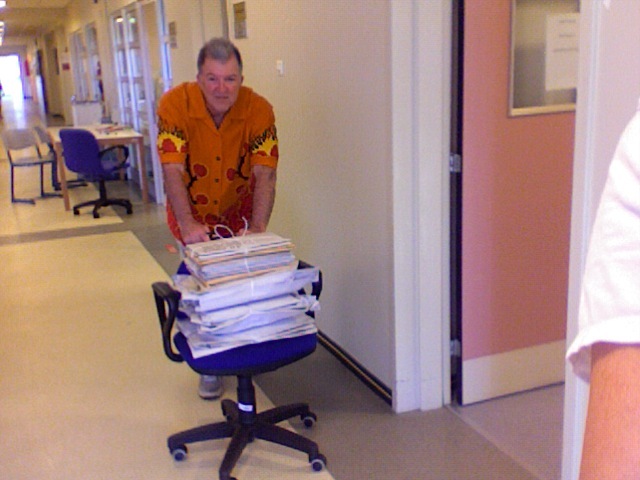 David transports our bundled exams. I have more interesting news, though. Last Friday I went to the European side to check out an apartment the Robert College director sniffed out for me. I took a teacher service bus to Bebek (which means “baby”), where I hopped off to enjoy the most stunning Starbuck’s on the planet—or so I’ve heard. It’s located right on the Bosphorous, with upstairs windows overlooking the waterway and a downstairs patio right on the water. Oh, my! Does it get better than this? 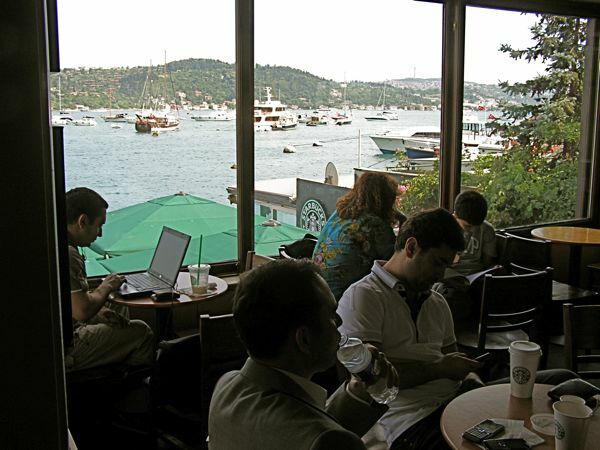 Bebek Starbuck’s: The best in the world? After the last few slurps of my frappucino, I moseyed along the water to Arnavutköy and Robert College. I was early, so I took my time climbing the hill to the school (sweat, sweat). Along the way I met former students who had heard I’m returning. What joy to feel appreciated. As I waited for Mr. Chandler outside the main building, more students and staff stopped to chat, again warming my path to yet another year of teaching. 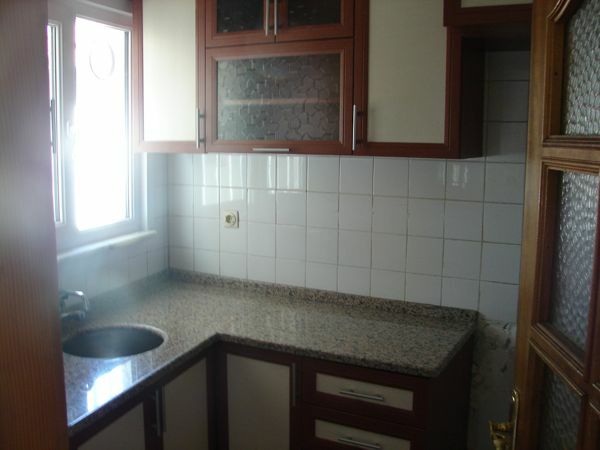 The apartment is sweet, bright, and has a view overlooking the Bosphorous, and it’s only about a 5-minute walk to school. The only drawback is that it has no closets—none. Interesting. The school will furnish it for me, but I’m sure I’ll have to buy something to hang my clothes in. Maybe IKEA? Where there’s a will, there’s a way. That evening I hiked back up to Bebek to join a bunch of Robert College staff celebrating birthdays at TAPS, yet another venue on the Bosphorous. 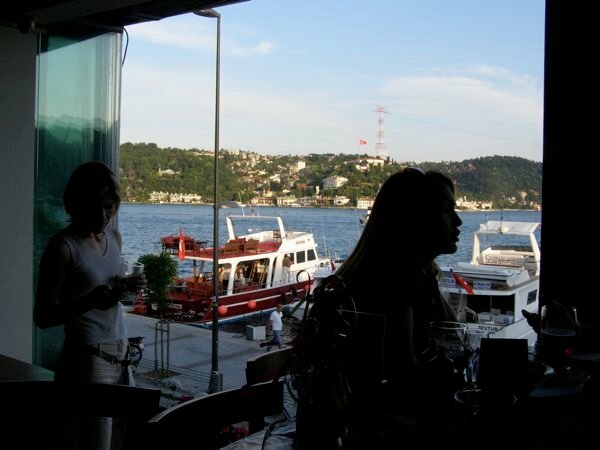 We sat at an upstairs bar-like table overlooking the water, boats skimming by as we sipped our drinks. Ah, does it get better? Well, read on. As the sky darkened, we walked the mile back to campus, where we congregated at Phil’s waterside apartment (in Yali) to chat, sip, and enjoy an INCREDIBLE bowl of homemade soup. Yup, it got better. Finally, I hiked up the steep hill with Gaby to her apartment, where I slept on her couch listening to night sounds and waking to yet another incredible view of the Bosphorous. Oh, my! Unfortunately, Gaby is leaving Robert, moving on to Bilkent University in Ankara to train teachers and to continue her turtle trips (see my blog from June 2008). The next day we woke early, and I headed off to meet my friends David and Nia in Beşiktaş. 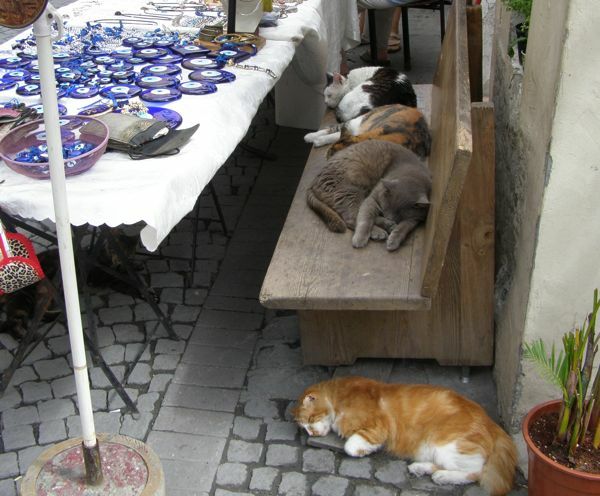 We hopped a bus to Ortaköy, where we relaxed over breakfast at a water-side restaurant, then shopped the “artsy” street bazaar. After that we headed to Sultanahmet to meet Dee and visit Musa’s rug studio. 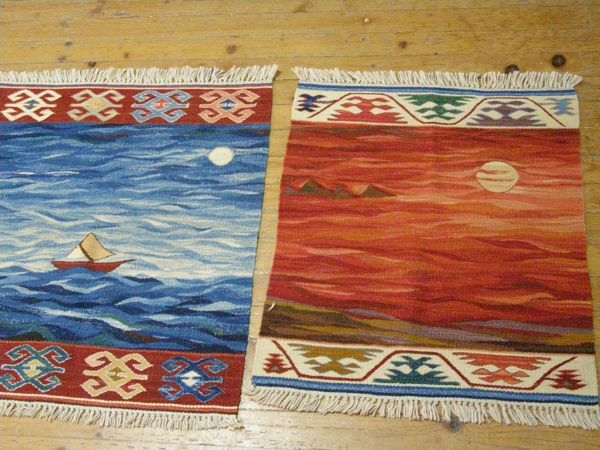 I bought two rugs, one for me and one for a friend, and David ordered one. 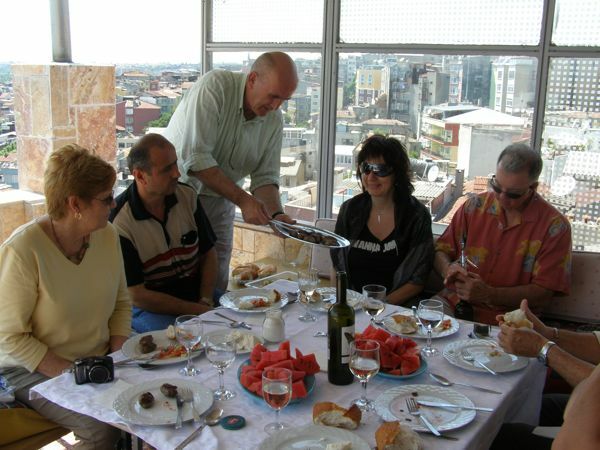 When we asked for a restaurant recommendation, Musa insisted that we share a BBQ on his 5th story balcony. We refused twice, but the third time was the charm. We were IN! When I protested that we would help buy the food, Musa scowled at me. “Ann Marie! You don’t know about Turkish Hospitality?” Yup, the weekend just kept getting better! Musa yelled to the produce man as he passed by the window, and I chopped veggies for a salad as he mixed the köfte (spiced meatballs). 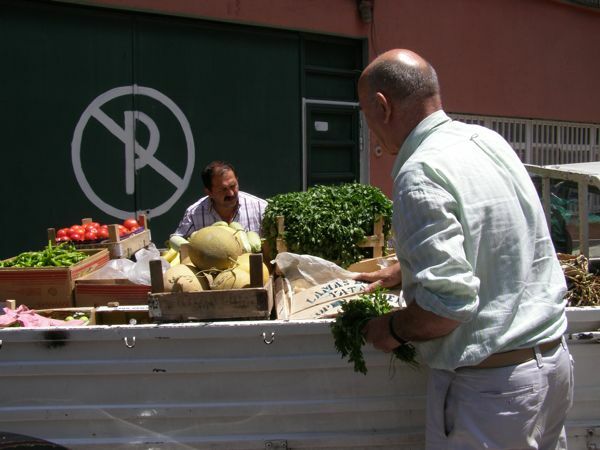 Musa chooses veggies from the produce truck in the street outside his studio. Everyone helped carry food and beverages up to the fifth floor, which was soon transformed from an empty balcony to a cozy restaurant. Amazing! It took us a few hours to get home, but it was well worth the extra time we’d spent chatting, eating, sipping, and reveling in Musa’s incredible view overlooking the Marmara. 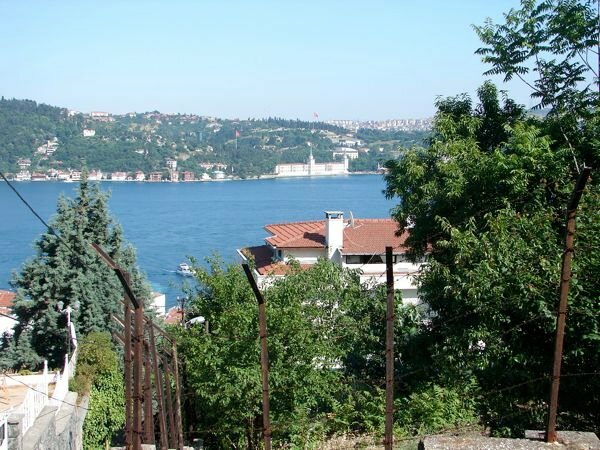 Istanbul is all about water and views. Well, there’s a little history, too, I guess. Musa’s fresh grilled köfte, shepherd’s salad, bread, cheese, watermelon, and wine.YUM!!! 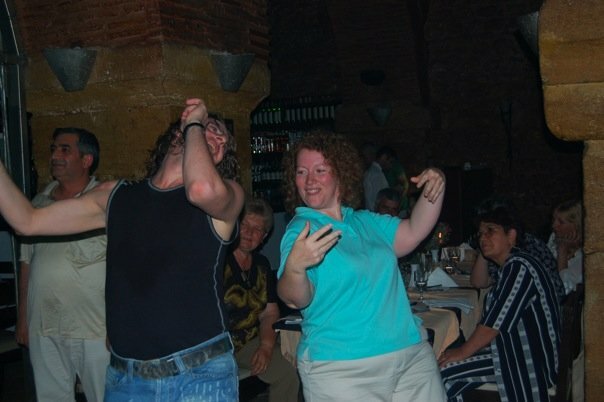 At 8:00 we turned right back around; 21 of us hopped on service buses to the Arkat Restaurant in the Taş Han for dinner, a floor show, and dancing. 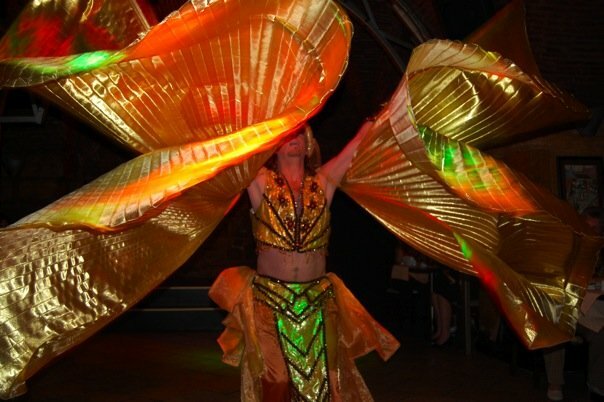 The highlight of the evening was a phenomenally talented belly-dancer—a MAN! Our French teacher got up with him, and since Jacqueline can bellydance, she was a real hit. The down side was that the traffic was horrid, and it took us 2 ½ hours to get there (about 20 miles). We missed part of the show, but many of us made up for it by dancing, dancing, dancing. 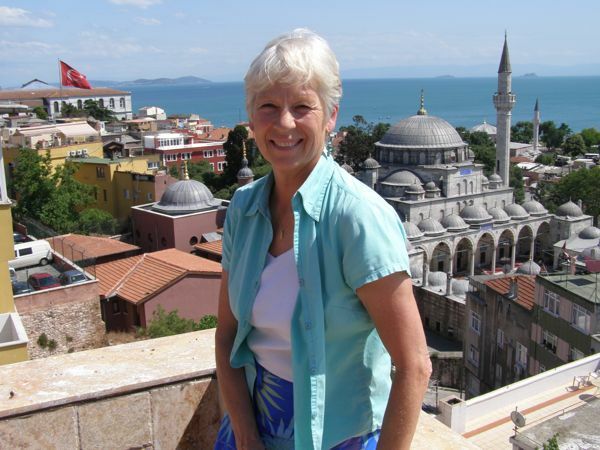 Hi Anne Marie, I am also a MN native living in Turkey. I see you are headed back to the states. Then you are planning to come back out to Istanbul again? Just wanted to say hello to another MN native. I do really miss things at times but am able to go back often. I have your blog linked to my site.